Tuesday February 2nd 1875 It was raining this morning so Will Reed took me to school and he came after me in the evening. I wrote some to Charlie and finished it up after I came from school. Will and I played cards in the evening. I do not feel very well. 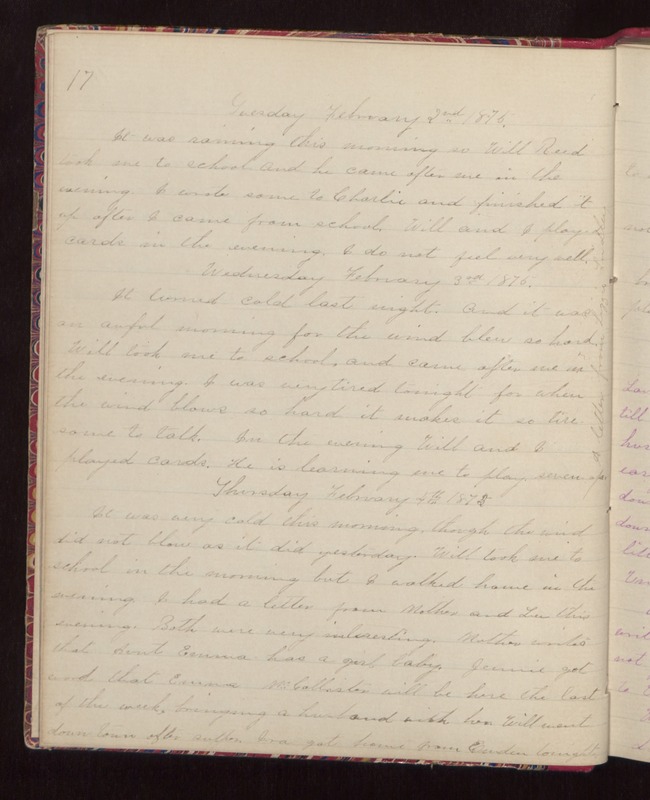 Wednesday February 3rd 1875 It turned cold last night. And it was an awful morning for the wind blew so hard. Will took me to school, and came after me in the evening. I was very tired tonight for when the wind blows so hard it makes it so tiresome to talk. In the evening Will and I played cards. He is learning me to play seven-up. A letter from Lizzie Lindley Thursday February 4th 1875 It was very cold this morning, though the wind did not blow as it did yesterday. Will took me to school in the morning but I walked home in the evening. I had a letter from Mother and Lee this evening. Both were very interesting. Mother writes that Aunt Emma has a girl baby. Jennie got word that Emma McCollister will be here the last of the month, bringing a husband with her. Will went down town after supper. Ira got home from Emden tonight.